Treat yourself to a Soft Finish™ Veil since they're perfect for all skin types. 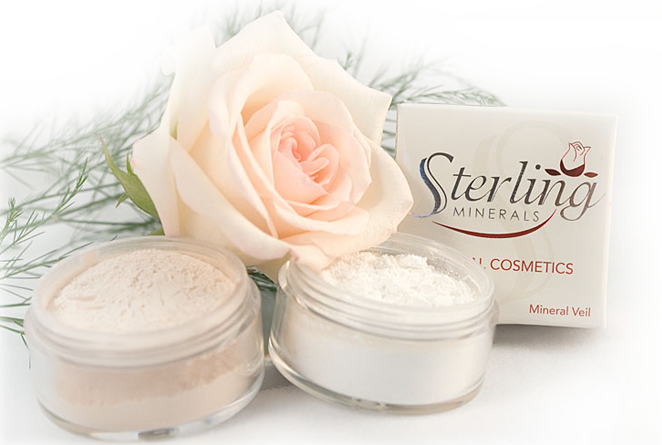 If you are dealing with skin issues such as acne, rosacea, seborrhea or psoriasis, you will enjoy one of Sterling Minerals Soft Finish mineral veils because they provide a barrier protecting the skin from trans-epidermal moisture loss and will enhance the lipids in your skin without interfering with your skins pH balance. The minerals and botanicals we've added to Sterling Minerals Soft Finish™ Mineral Veils are designed to support the natural regenerative process of problematic skin. Our Rice Powder Soft Finish™ formulas are extremely gentle to your face but especially pampers skin of mature years, acne prone skin, and sensitive skin. The natural benefits these offer to you are only loved all the more by how sheer they apply, while leaving your skin soft as velvet. You only need very little of these concentrated veil formulas for sufficient coverage, so they will last you a long time making them very economical. Satin Rose Veil - This is a sheer skin softening finishing veil. Works as an excellent pore filler, blurs fine lines and wrinkles, and will look flawless and smooth all day. Also leaves skin with an airbrushed polished appearance. Quite gentle on acne, rosacea and sensitive skin. Evening Rose Veil – This is used as a night time treatment or as a finishing veil for adding extra oil absorption for women with excessively oily skin or to soothe skin irritations caused by acne, rosacea or other sensitive skin issues.